Looking For The Best Large Breed Puppy Food? Then You’ve Come To The Right Place! We Have Reviewed All The Top Options. To Help You Make The Best Choice For Your New Furry Friend. Puppies of all breeds require good, nutritious food in order to grow big and strong. But large breed puppies often need more food and/or specific nutrient requirements to ensure that they grow into those big ole’ paws! After all, large breed puppies tend to grow for a good bit longer than small breed puppies. There’s simply more body mass to fill out and develop than on a smaller dog. 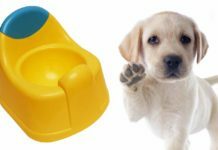 In this article, you’ll learn about various types of puppy food that’s specific to large breeds. Including dry, wet, organic, grain-free, limited-ingredient, and high-quality formulations. We will look at these and more in detail in the article below. Large breed puppies tend to have a slower growth rate than their medium-, small-, and toy-sized counterparts. In a 2004 study published in the Journal of Nutrition, of the toy, small, and medium dog breeds that participated in the study, 99% reached their adult weight at 9 to 10 months old. While the large and giant dog breeds didn’t reach their adult weight until somewhere between 11 and 15 months of age, sometimes longer! What all of this means is, it takes large puppy breeds a good bit longer to reach their mature height and weight than it does for smaller dogs. 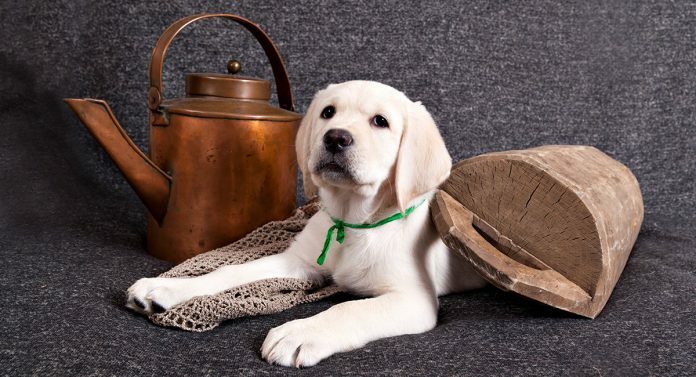 Although a two-month-old Labrador will obviously be much bigger than a Beagle of the same age. With an increased growth period comes a prolonged need for the nutrients necessary to keep making leaps and bounds on the height and weight chart. And, since exponential growth occurs in dogs of all sizes from birth through five months of age, it’s vitally important that they get quality food that’s suitable for their energy requirements. But not in excess such that the effects are detrimental. Puppies aged four to 14 + weeks need a minimum of 9.7 grams to 12.5 grams of protein per kilogram of body weight per day. However, too much protein can throw off your puppy’s calcium and phosphorous levels, which may lead to bone deformations. Additionally, large breed puppies should not be allowed to grow up too quickly. Which a high fat diet would allow him to do. This accelerated growth rate from fat consumption could surpass his bone growth, putting him at risk further for developing skeletal issues. This is where the best large breed puppy food can be of assistance. Is large breed puppy dog food necessary? Large breed puppy food reviews are varied. Premium foods such as breed-specific or size-specific ones may differ from other similar foods in a number of ways. They lack ingredients that tend to aggravate a certain breed (such as zinc causing dermatitis in Huskies). An increased amount of the vitamins or minerals that help to maintain the breed based on optimal health requirements. They have less of the ingredients that aren’t needed and/or that which could be too much of a good thing for some puppies. 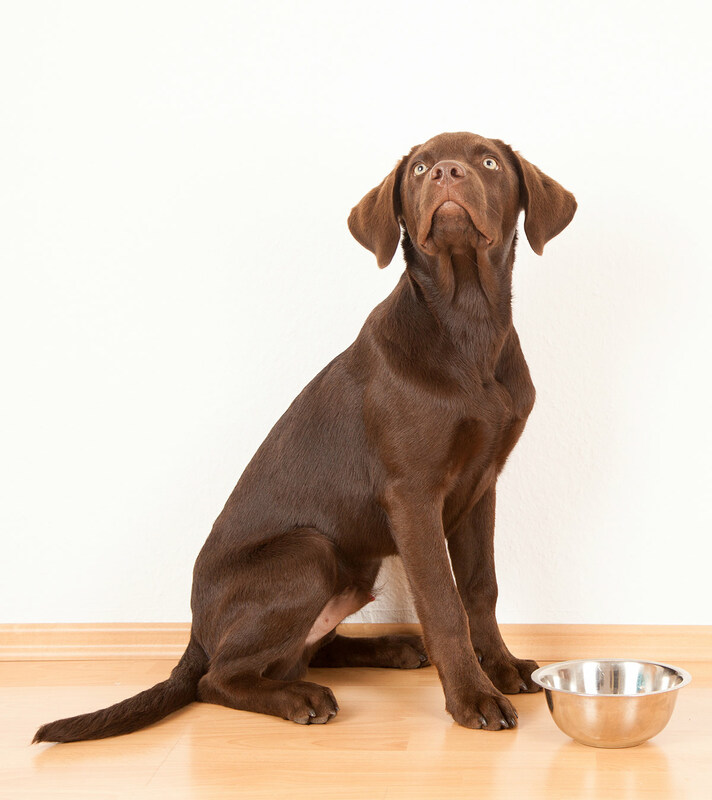 Such as fattening or filler ingredients for Labs, who easily gain weight and are predisposed to hip dysplasia. At the very least, breed- or size-specific puppy food may simply be kibble that’s more appropriately sized for the intended puppy. For example, a large breed puppy may find larger kibble easier to eat than the small kibble that’s intended for smaller mouths. 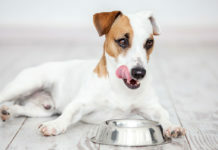 All commercially produced pet food must meet specific rules and regulations as defined by the Food and Drug Administration in order to be sold. Furthermore, any food that’s intended for puppies must meet the Association of American Feed Control Official’s (AAFCO) profile for growth and reproduction. Therefore, your puppy could be getting a certain amount of the nutrients that he needs from any puppy-formulated food. Assuming he’s fed the amount that’s advised for his weight. But he may not be getting optimal amounts of the best nutrients for him without being fed a premium breed-specific food. 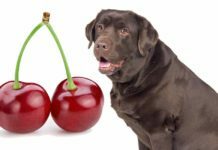 What is the best large breed puppy food? So, what large breed puppy food is best? The best food, regardless of its labeling, is that which your puppy finds palatable, meets all of his nutritional requirements. And keeps his digestive system moving while maintaining proper bone and muscle tissue growth. We’ll talk about a few brands and types of large breed puppy food formulations in the upcoming sections. A grain-free diet may help to decrease the amount of extra carbohydrates and starches that your large puppy ingests. As we mentioned previously, allowing a large breed puppy to gain too much weight can spell bad news for his bone and joint formation! 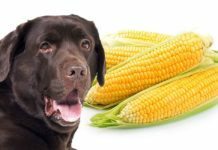 Grain-free foods exclude corn, wheat, and soy; all of which are commonly used as fillers and to which some dogs are allergic. They are also typically higher in protein than other commercially produced dog foods, making them a good option for large doggies that need more protein than standard puppy foods provide. The seemingly lesser known Orijen Large Breed dog food is made from all regionally local ingredients. It contains 80% protein from chicken liver, free-range turkey and chicken, fish, and eggs. A few different fruits and vegetables make up the remaining 20%. It’s also enhanced with prebiotics and probiotics to assist with digestion. Is this the best large breed puppy food for your young dog? Looking for large breed puppy food without chicken? Then this Diamond Natural’s grain-free lamb and rice formula may be perfect for your pup! Added omega fatty acids provide a boost for your puppy’s skin and coat, and extra calcium and phosphorous will help to support a healthy skeletal system. As an added bonus, the formulation helps to maintain a lean disposition – fat puppies are cute, sure, but very unhealthy! For many dog owners, dry kibble is the most convenient to feed. However, the nutrition content across dry kibbles can vary widely… Especially when looking at mass-produced verses premium varieties. Some kibbles contain too much fat and not enough protein. Here are some premium kibbles for large breed puppies that conform to the aforementioned guidelines for the best large breed puppy food in kibble form. Hill’s large breed puppy food is veterinarian-recommended. This lamb and rice formulation provides plenty of protein, calcium for bone health, and lots of minerals for even more support. Vitamins C and E will also boost your dog’s immune system. The Iams Large Breed Puppy Food is a proactive, dried dog food. And could be the best large breed puppy food for your dog if you are looking for a kibble. Real chicken is the first ingredient in this kibble, making it an excellent source of muscle-building protein! You won’t find any fillers, soy, wheat, or artificial dyes or preservatives in this food. But you will find sources of antioxidants and omega-3 DHA, which is pivotal for healthy brain function. Find out more about it on Amazon here. In some cases, dry kibble isn’t enough to keep your large breed puppy looking and growing his best. Wet food is a great way to top-dress dry kibble to make it more enticing for picky eaters, or you can use it to add some more moisture to your puppy’s diet. And if you don’t feed kibble, a high-quality wet food made specifically for large breed puppies can provide all of the goodness that your fur baby needs. We like the following wet food varieties. We’ve shared a few large puppy dog kibbles that feature rice and lamb, but the good news is that you can also buy your dog the same healthy formula in wet form! Like this Nutro large breed puppy food. Your puppy will love digging into chunks of lamb that’s covered in gravy with other all-natural ingredients. This food comes in packs of 12 cans. Here’s another lamb and rice formulation of wet dog food. This Eukanuba option is suitable primarily for puppies aged one year or less. Eukanuba’s premium food has just the right balance of proteins to fats to carbohydrates to help your puppy grow lean muscle mass without overdoing it. This variety also comes in packs of 12 cans. 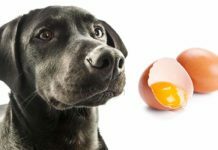 Unfortunately, some doggies are born with or develop sensitivities to certain foods or substances. 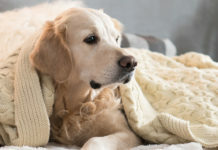 And as we mentioned earlier in this article, some dogs are particularly susceptible to having food allergies that are common in a breed, or they may inherit certain allergies from their parents. The most common offenders are dairy products, beef, wheat gluten, chicken, chicken eggs, lamb, and soy. 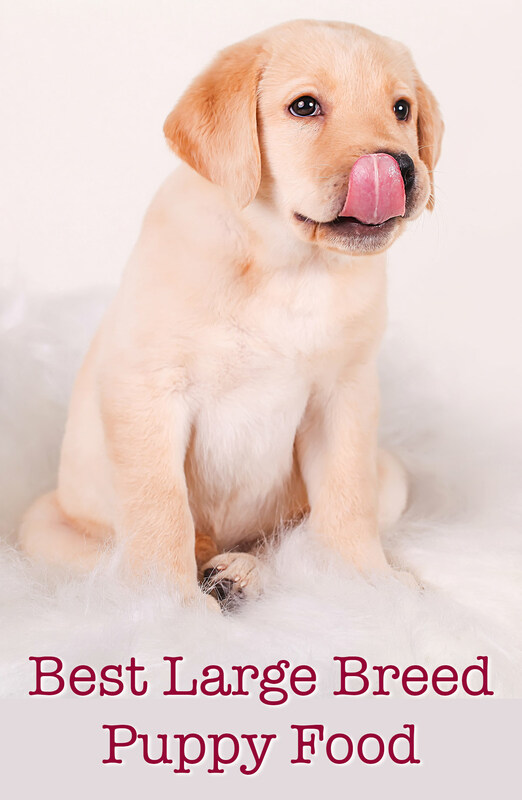 Although we couldn’t locate large breed-specific limited ingredient puppy food with limited ingredients, we did find these limited-ingredient puppy foods that are suitable for any breed that you might try. This Blue Basics Limited Ingredient Formula deboned turkey and potato-based kibble also includes pumpkin, oatmeal, and rice. All the ingredients of which are easier for a puppy with a sensitive tummy to digest. Additional vegetables and fruit provide healthy fiber sources. Try this food for your puppy if he’s experiencing itchy skin, digestive issues, respiratory distress, or other symptoms of food sensitivity when he eats other types of food. This is a lamb- and brown rice-based kibble, by Natural Balance. It’s only suitable for dogs that are definitely not allergic to lamb. For those that can eat lamb, it’s a great source of lean protein, and the brown rice helps to promote skin and coat health. A bit of canola oil is a great source of omega fatty acids, and simple carbohydrates keep the kibble easy to digest. Fromm large breed puppy food is one of the best large breed puppy food choices for many owners. The food is loaded with duck, chicken, lamb, whole eggs, and cheese. It’s also manufactured by a family-owned company. Purina’s Pro Plan Focus chicken and rice formula is a good-quality option. Real chicken is the primary ingredient, and ingredients like DHA assist with brain and vision growth as well as antioxidants for a healthy immune response. Free-range chicken is the primary ingredient in this Castor and Pollux kibble. It includes organic brown rice, flax seed, and a range of vegetables for your puppy’s skin, fur, and digestive health. Without all of the fillers, this food is a lovely high-protein, low-fat option that you can also feel good about feeding. This Newman’s Own Premium food is “made-with organic,” meaning that at least 70% of the ingredients are 100% organic. This particular formula is made with organic turkey and chicken, and it does not contain any wheat or corn. The best large breed puppy food is that which meets your particular pup’s growth and other health needs. Premium large breed puppy foods are a good idea because they typically contain a ratio of protein to fat to carbohydrates that’s more appropriate for large dogs. As large dogs are often prone to musculoskeletal issues and shouldn’t be allowed to become overweight. However, there is definitely such a thing as too much protein, as this can cause a calcium and phosphorous imbalance that lets your big puppy to grow faster than his bones can. This situation may translate to deformities or joint issues later on. Some breed-specific puppy foods may also omit certain ingredients that trigger allergic reactions in certain dogs. And they may also boost certain vitamins and minerals to help combat breed-specific illnesses. Regardless of what brand or type of food that you select, you must select the best large breed puppy food to fits your particular puppy’s needs. Have you got an option for the best large breed puppy food, which we haven’t included? Let us know in the comments section below! Hawthorne, A.; Booles, D.; Nugent, P.; Gettinby, G.; Wilkinson, J. “Body-Weight Changes during Growth in Puppies of Different Breeds.” The Journal of Nutrition, 2004. Previous articleCan Dogs Eat Marshmallows?